Tactics of Innovation explores a problem that plagues organizations everywhere – why smart people reject good ideas. This program is available in French. 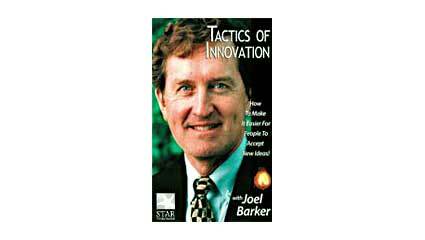 In this landmark video, Joel Barker goes on location to share stories on why people say “no” to new ideas. More important, he introduces a ten step strategy on how to remove barriers between new ideas and people who naturally resist change. These tactics will dramatically increase the acceptance of any kind of idea. Why is it important to understand Tactics of Innovation? Because, “it is natural and logical for people to resist change,” says Joel Barker. New ideas upset the balance and change makes things difficult. Only by developing the ability to present your idea from the users point of view will you be able to achieve success. Tactics of Innovation is an important message for business, nonprofit, government, education, healthcare – any organization that wishes to not only discover new ideas, but bring them into practice. What social equilibrium is and how it impacts new ideas. The value of presenting ideas from the users point of view. A ten-step strategy for getting new ideas accepted!